Math: Today we review what we talked about previously before the break. First we talked about bar graphs and what is necessary in order to draw one. They told me that you need to write the numbers on the line and the labels necessary for a bar graph. We also practiced reading one. Next we talked about pie graphs and the fractions necessary for reading a pie graph. We talked about the bottom of the fraction and that it is the total number of parts in the graph ( or the total number that it could be if you are trying to determine a pie graph that doesn't have the same fractions throughout it). They need to use a pencil and lightly draw it evenly to see how it would look like if it was the entire pie graph was that fraction. 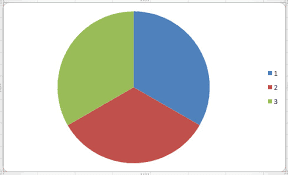 This pie graph has all the same fraction and is separated into thirds. 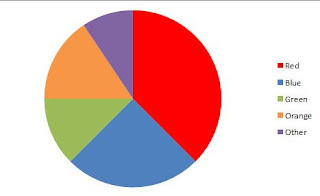 If you cover up the red and purple side you can see that the orange and green make one quarter of the pie graph. If you lightly draw lines across it you can see that the green and blue are make up 2/8 of the pie graph. 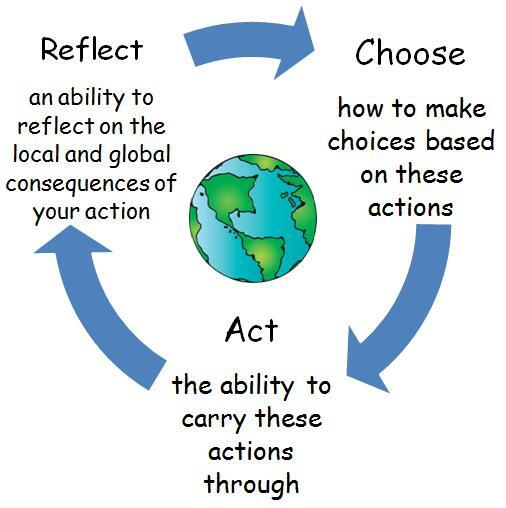 Language: Today we continued talking about our fractured fairy tale. We began talking about the sections of a story or fairy tale and what is necessary for each section. We created an example together and talked about what we would include. We put our story into a story mountain outline. They put in small details and not full sentences. They are coming along well! Tomorrow we will do the rough draft. UOI: We continued to work on our story mountain worksheet.